Purposeful test taking strategies can build confidence and help students show what they know on standardized tests. 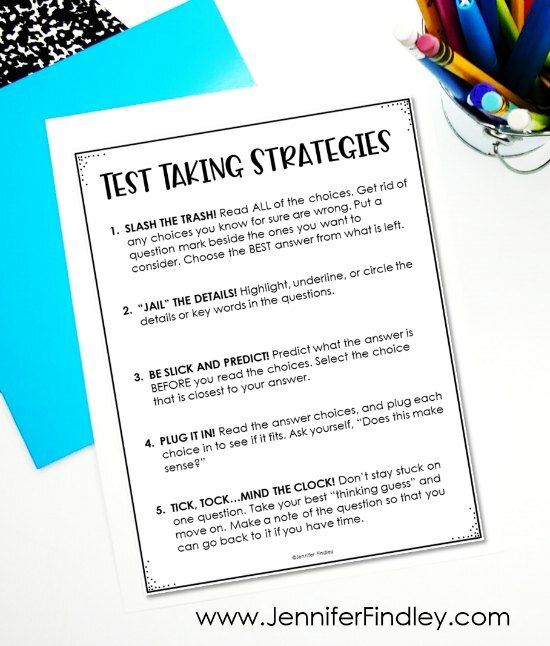 This post shares tips for teaching test taking strategies, the difference between test taking strategies and best practices, and free resources for the specific strategies I teach my students. Note: I did not create the catchy sayings for the test taking strategies. I have been using variations of ones found online for the past 10 years. If anyone knows of their original creator, please let me know in the comments so I can credit them. Test taking is not the heart of education, despite how it may seem. I never want my instruction to be meaningless and teaching to a test. However, I do teach my students test taking strategies. 1. Embed the test taking strategies all year through the variety of tests given. When my students are about to take a test and I know one of my test taking strategies will benefit them, I introduce it, model it, and then require them to use it on at least half of the problems. 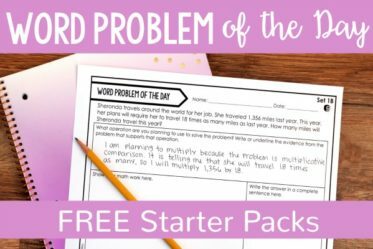 By Completing a Similar Problem – Before a test, I may write a similar problem as the students will see on the test on my whiteboard and then model the test taking strategy that I want my students to try out. By Completing the First Problem on a Test Together – Similar to above, sometimes I will work through a test problem with the students and model the strategy before they complete the rest of the test. 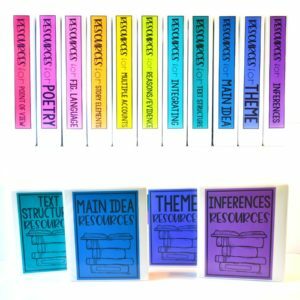 Details about how you can get the printables shown above for free in the section titled – Want FREE Test Taking Strategies Printables with Questions? 3. Explain why the test taking strategy works and how it benefits students. If students just see a test taking strategy as a “hoop they have to jump through,” they won’t truly understand the purpose and benefit from it. 4. Combine test taking strategies with best practices and authentic instruction in the subject areas (more about this in the next section). When you combine best practice instruction with a few purposefully chosen test taking strategies, you will see a difference in test scores and even student attitudes toward tests. 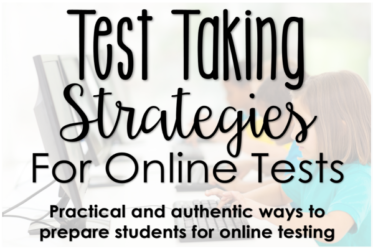 Now, let’s get into the test taking strategies that I teach my students. Read ALL of the choices. Get rid of any choices you know for sure are wrong. Put a question mark beside the ones you want to consider. Choose the BEST answer from what is left. Highlight, underline, or circle the details or key words in the questions. Predict what the answer is BEFORE you read the choices. Select the choice that is closest to your answer. Don’t stay stuck on one question. Take your best “thinking guess” and move on. Make a note of the question so that you can go back to it if you have time. 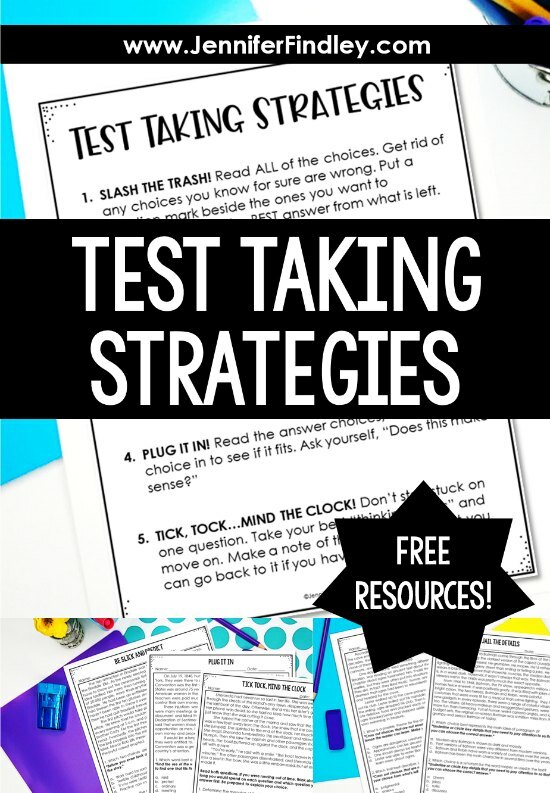 —-> Click here or on the image below to grab the free test taking strategies posters! The ones I use may be a good start for you and may be what you decide to implement. 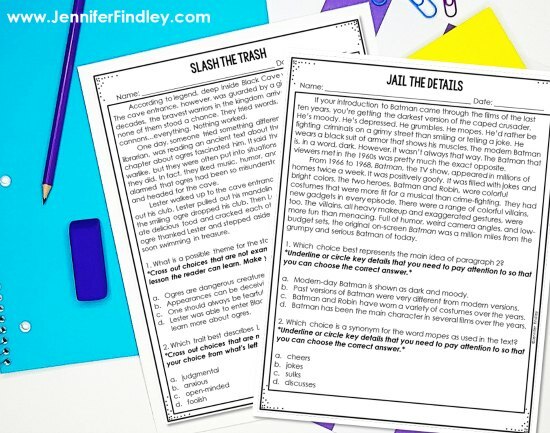 However, I want to share some tips for how to generate your own test taking strategies based on your students, their needs, and the needs of your assessment. 1. Study your state test. While you are studying the test, think about what test taking strategies would most benefit your students to succeed with the majority of the questions. 2. Analyze the behaviors of your students. What are they currently doing or not doing? What can you teach them that will help them show what they know on a test, ease their anxiety, or help them focus on a test? 3. Use simple test taking strategies to help them focus on what they are missing, help ensure they do what they are not doing, or help them avoid what they are doing that they shouldn’t be. Don’t over complicate it. If the strategy is overcomplicated, students may struggle remembering it and implementing it. 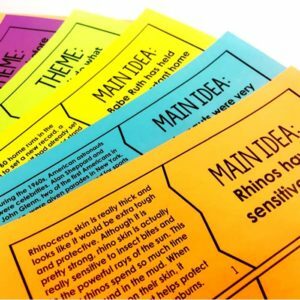 Want FREE Test Taking Strategies Printables with Questions? As I mentioned above, I like to teach these test taking strategies throughout the year as my students take tests. However, I also like to have specific lessons to review the strategies before the test. 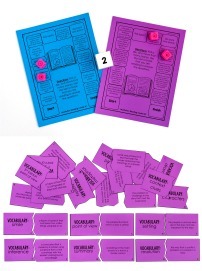 For test taking strategy lessons, I focus on one strategy per lesson. We read and discuss a short text (variety of fiction and nonfiction) and then answer multiple choice questions that are written specifically for the students to use the test taking strategy of the lesson. Join my email list to have the reading texts and questions that I use for each strategy sent straight to your inbox. NOTE: These are separate from the freebie library. Success! Now check your email to grab your freebies! 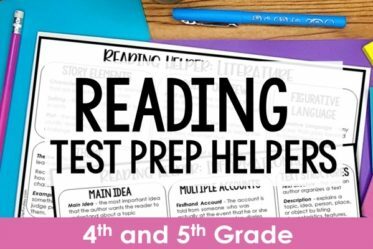 Need Reading Test Prep Resources? 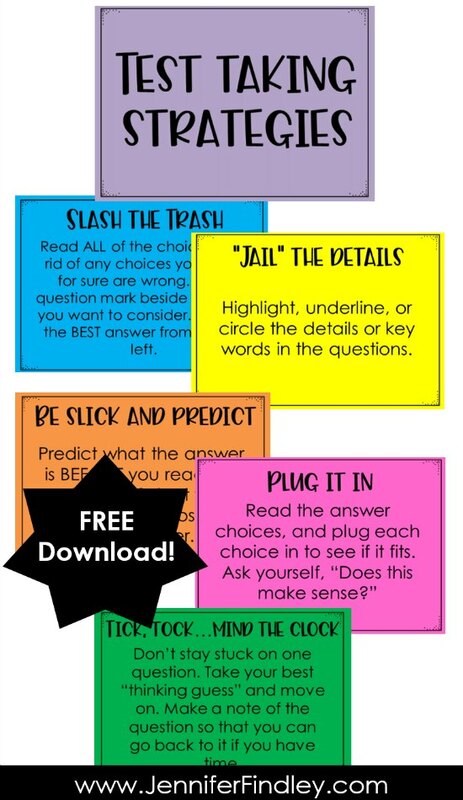 This resource works perfectly for multiple choice test prep review and using the test prep strategies shared on this post. Do you need an engaging test prep reading review that focuses on multiple choice questions? 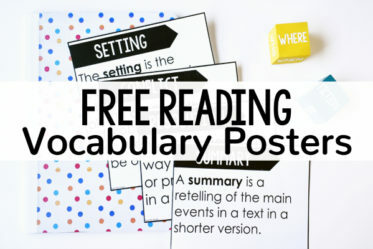 This resource includes 32 reading fiction test prep task cards and 32 nonfiction test prep task cards that focus on 4th and 5th grade reading skills. 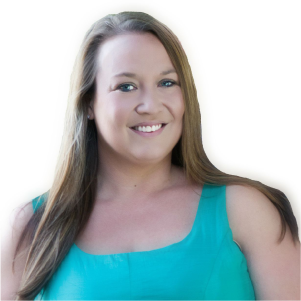 Want More FREE Test Prep Resources? 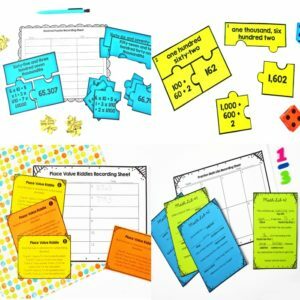 Are you in need of FREE test prep resources and activities to engage your students and help them feel confident about the test? 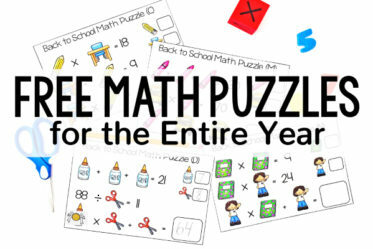 I have a special free email series with TEN different test prep activities for grades 4-5 math and literacy teachers. 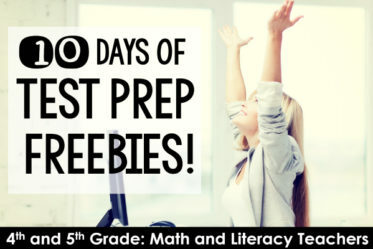 Click here to get all of the details and sign up for the 10 days of test prep freebies, sent straight to your inbox. 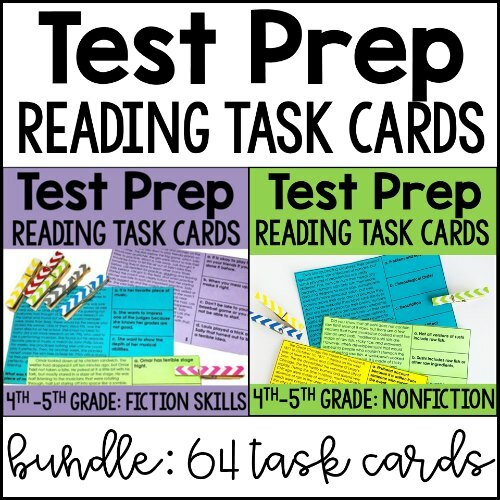 Want even more test prep ideas and activities? 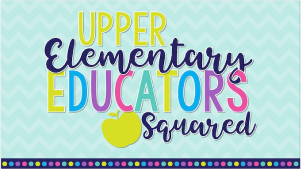 Click on the links below to get even more ideas to implement engaging and relevant test prep that you and your students will love!